Life’s defining moments can happen so fast, we often fail to fully appreciate the essence of the experience. Whether it’s a child’s first steps, a school play, graduation or a wedding day – having a video to re-live your happiest times with friends and family can become one of your greatest treasures. 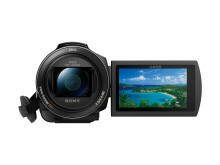 Sony’s newest Handycam camcorders allow you to perpetuate those moments in vibrant 4K detail. 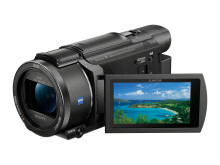 The patriarch of this year’s camcorder family takes form in Sony’s newest 4K Handycam, the FDR-AX53,combining enhanced image quality and incredible sound performance. 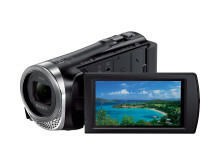 The FDR-AX53 features a new Exmor R CMOS sensor, providing exceptionally detailed 4K movies. Due to the new sensor’s approximately 1.6x larger pixel sizeii, the FDR-AX53 enjoys a much greater sensitivity level than its predecessorand allows for fantastically clear content with outstanding resolution even when shooting in low light conditions. The FDR-AX53 features a newly developed ZEISS lens that extends to a wide angle of 26.8mmiii, accurately capturing the scene from wide angle through to telephoto. The lens empowers the camcorder with a remarkable range of 20x optical and 30x (4K)/ 40x (FHD) Clear Image Zoom, for beautiful close-up footage you don’t want to miss. Due to its Advanced Aspherical (AA) and Extra-low Dispersion(ED) lens elements, colour fringing is highly reduced allowing the lens to produce incredibly accurate colours for beautifully precise footage. The multi-layer film ZEISS T* coating reduces unwanted reflections like ghosting and flare which delivers a crisper, clearer image even when shooting on bright days outside. 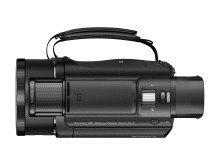 The FDR-AX53 is the first Handycam with an enhanced version of Sony’s own Balance Optical SteadyShot; a 5-axis image stabilisation system that brings you blur-free footage when shooting handheld and thanks to its new Intelligent Active modev, also ensures crisp footage whilst running. This incredibly powerful image stabilisation system allows for exceptionally smooth and clear video footage from all angles, even when on the move or whilst using the telephoto end of the 20x optical zoom when aiming for close-ups shots. The new Intelligent Active mode takes it a step further and even allows for incredibly clear HD footage when running. The FDR-AX53 records at an incredible high bit-rate of 4K 100Mbps, using the high-performing XAVC S™ recording format[vi], allowing each frame to be filled with astonishing 4K detail so you can relive everything from splashing waves to colourful confetti. The camcorder comes with a newly adapted AF algorithm, Fast Intelligent AF, also featuring in Sony’s α7S II, which optimises communication between the lens and processor to achieve speeds up to approximately 40% fasterii than previous models and more precise subjectcapture. The FDR-AX53’s new microphone structure collects sound from five directions, thereby capturing real-life sounds and delivering a more realistic sense of ambience. Due to the enhanced microphone structure, noise levels have been reduced by approximately 40%ii, and stereo performance is approximately twice as high as previous modelsii, allowing for clear recordings in a greater range of environments. 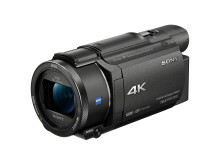 Its 5.1ch microphone records high stereo sound in 2ch in XAVC S 4K/HD and high surround sound in 5.1ch in AVCHD. In addition, the My Voice Canceling function reduces the user’s own voice whilst recording. 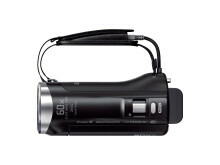 As a first for the Handycam series, the FDR-AX53 can record at 100fps in Full HD meaning that footage can be edited into breath-taking slow motion footage with the free PC software, PlayMemories Home™, to add a whole new dimension to home movies. It boasts many pro-style refinements for greater shooting flexibility, including a manual ring and button that can be allocated to functions like zoom, focus and exposure and electronic viewfinder (EVF), allowing the user to easily compose scenes even when recording on sun-filled holidays. For greater control of the edit, advanced users can benefit from Time Code and User Bit options. To enjoy recorded footage at home, 4K content can be played back on a compatible 4K TV through a supplied HDMI cable or by automatic down conversion of 4K frames in Full HD playback on an HD TV. 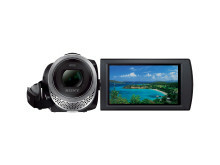 For beautiful framing, this Handycam also allows you to playback trimmed 4K images from selected video frames, enlarging or cropping[viii] selected parts of the frame in Full HD quality. 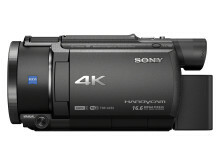 Sony’s Full HD camcorder range welcomes two new members, HDR-CX625 and HDR-CX450. As with their elder siblings, they extend to a generous wide angle of 26.8mmiii, meaning beautiful family moments can be captured in any situation. Both new models benefit from image stabilisation technologies including advanced Balanced Optical SteadyShot with 5-axis Intelligent Active mode on the HDR-CX625, and Optical SteadyShot with 5-axis Intelligent Active mode on the HDR-CX450–ensuring highly detailed, blur-free footage. 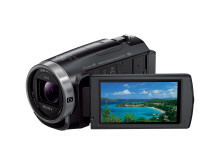 The Handycam camcorders allow for XAVC S 50Mbps high-bitrate recordingvi and also feature Fast Intelligent AF. With 5.1ch surround microphone performance[ix] and My Voice Canceling, superb sound quality is also guaranteed. Using Sony’s free PlayMemories HomePC software, you can organise and edit your footage and also create your personal high-quality time-lapse moviesvii with Time-lapse Capture for powerful, impactful scenes in 4K using the FDR-AX53 and HD with the HDR-CX625 and HDR-CX450. To get others involved in the action, all new Handycam models allowLive Streamingvia USTREAMTM [x], enabling you to stream HD video footage and sound from Handycam camcorders through a wireless access point. You can now ensure that no one, no matter how far away, will miss out on those defining moments, no matter where in the world they may be. 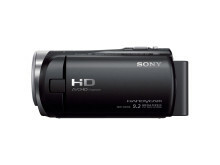 Like all of Sony’s Handycam line up, the new models feature the automatic in-cam movie editing function, Highlight Movie Maker[xi], which picks key moments in your footage like laughter or zoomed in moments and assembles them into short-clips without any need for post-production editing. You can customise with transition effects and soundtrack music and once completed, easily share your MP4 movie on social media sites. 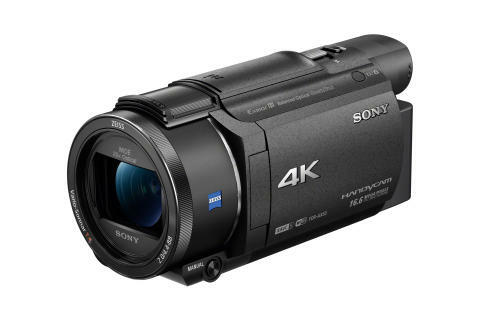 Sony’s new 4K Handycam will be available in Europe from mid-March 2016, priced at approximately €1000; the Full HD camcorders will be available from mid-February 2016 at approximately €500 for the HDR-CX625 and €350 for the HDR-CX450. 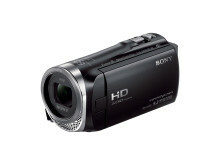 Full specifications on the new FDR-AX53 can be seen here; for the HDR-CX625 please refer here and for the HDR-CX450 here. [vii] Available with PlayMemories Home. To create time-lapse movie, ver. 5.1(Windows)/3.1(Mac), scheduled for release in January 2016, or later is required. [x] Requires a Wi-Fi router or smartphone capable of tethering.